I recently had to replace the float valve in the brine tank of our water softener. The first time I tried it, the valve did not close and the water overflowed through the overflow vent, filled the emergency bucket I had placed there, and continued to spread across the floor of our storage area. I figured it was a bad valve, but after manipulating it a few times, it seemed to work fine. Perhaps it was just stiff because it was new and would now function properly. Nevertheless, I did not trust it and wanted a quick and dirty alarm to tell me if the water in the brine tank rose above its normal range. Of course, I turned to my favourite little board for Internet of Things connectivity, the ESP8266. These handy little boards are down to $1.50 including shipping from China. The mind boggles at the value. Pololu has recently added a really handy little board to their line of fine products. The Mini Pushbutton Power Switch with Reverse Voltage Protection, LV version, is a power switch capable of turning on or off any device using either the mini push button on the board or an external on, off, or control signal. It can handle 2.2 to 20 volts at up to 6 amps. It turns out to be very useful for many projects. In this case, I will use it to turn on the ESP8266. This is a temporary installation for testing purposes. 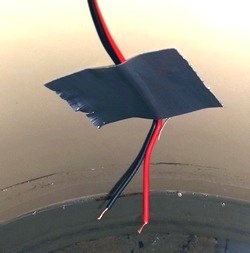 Once the tank is filled properly, the wires would have to be protected from the salt. It would be easy to put them in a PVC pipe, or even just surround each electrode with some tubing. I will probably do that in a few days, when I am satisfied that the valve and system are doing what they are supposed to do and I refill the tank with crystal salt. and do bad things to drinking water if it causes minerals to precipitate. 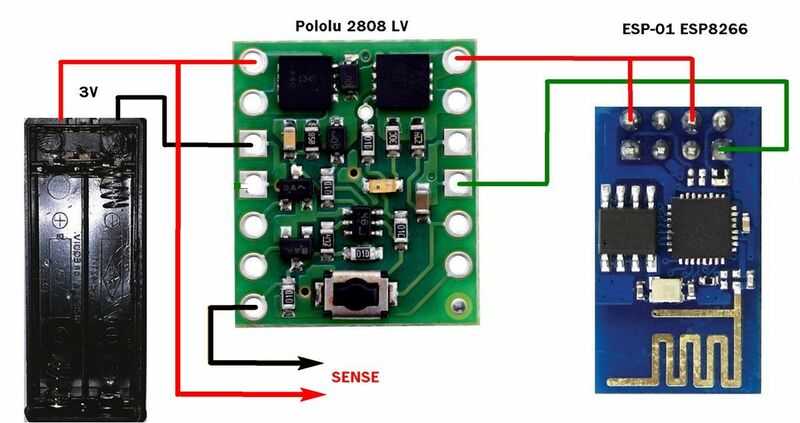 The project consists of a battery pack (2 AAA cells), the Pololu 2808 switch, and the ESP8266 board. Any battery pack could be used as long as it does not exceed 3.6 volts. 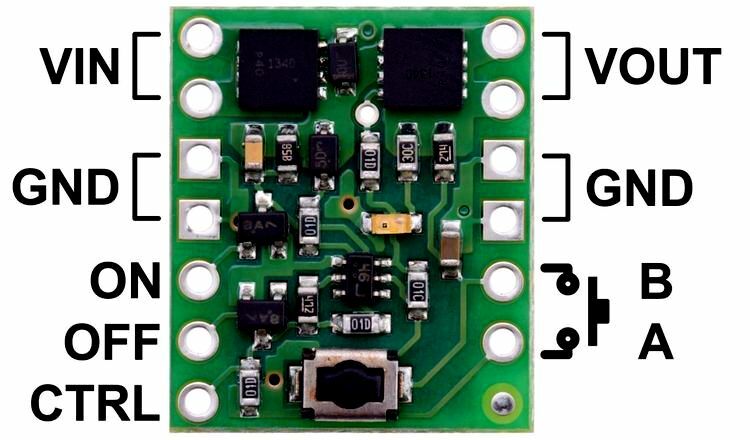 Any of the various ESP8266 boards can be used. This project was built with the cheap and simple ESP-01. The push button on the board can be used to turn on the ESP8266 for testing, and to turn it off once the water level is below the sensor wires. 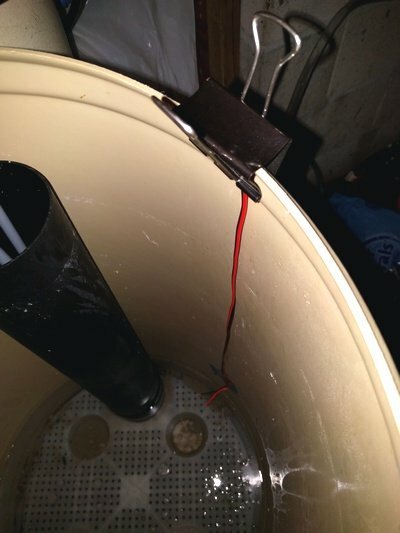 The boards were connected with hookup wire and hang on the outside of the tank for now, secured by a bulldog clip. They will go into an enclosure later if I decide to keep this sensor in place. or a higher than normal water level in a storage tank. Since almost no current flows in the standby mode, the batteries should last for a very long time. I am a fan of the simple NodeMCU Lua system that has now been available for over a year. My first project using the ESP8266 and Lua was a pump monitor on our well, which simply reports when the pump is on. That board has been reliably connecting to the server since December 1, 2014 and it has generated a lot of useful information about our water usage. There have been improvements to the Lua firmware and a great deal has been learned about implementing WiFi solutions on the ESP8266. then links to the server does everything required. The server code takes care of data storage and customized notifications. The Button and a number of other projects use this system. All that needs to be changed is the URL. To download the code to the ESP8266 board, I used LuaLoader for Windows. There are numerous other programs now available to do the job. 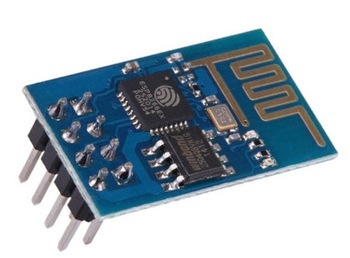 If you are an Arduino fan, there is an Arduino firmware installation available for the ESP8266 which can also be used to implement the simple firmware required. The Arduino installation is supported by both sparkfun and Adafruit. IFTTT Maker Channel was designed to connect IoT devices, like this monitoring system, to the notification you need. OVERFLOW is the event trigger name, I have chosen for this event. Yourownkey will be assigned to you the first time you create a new Maker recipe. When the trigger URL is called by the ESP8266, all recipes based on that trigger URL will be executed. 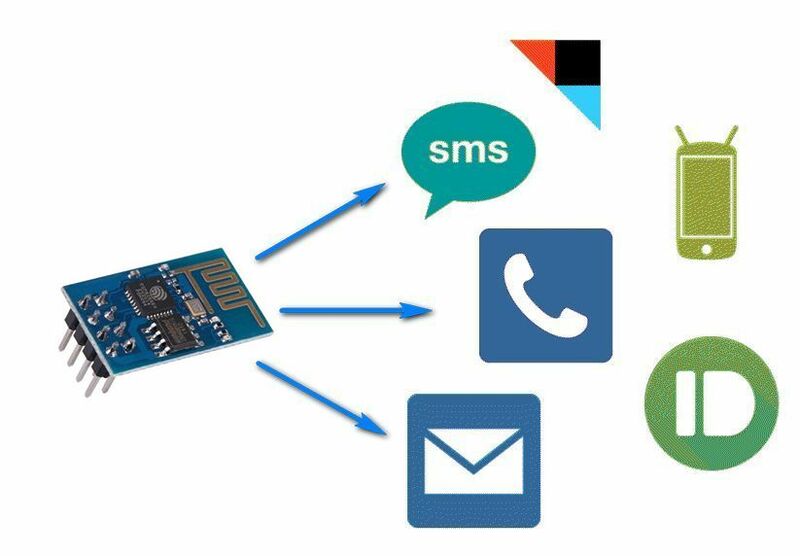 There are hundreds of actions available, including sending emails, SMS messages, adding items to DropBox, adding data to Google Drive spreadsheets, and even sending a message to another ESP8266 equipped with an LED or alarm sound.